Know Why jQuery Mobile Is Preffered For Mobile Web App Development! Why jQuery Mobile Is Suitable For Mobile Web App Development! jQuery Mobile is an advanced tool for mobile web application development. It comes with various amazing features that ease the way for developers to code the smart web application. The smartphones’ & tablets’ usage for accessing the internet is increasing at a fast rate. According to the study, it has been concluded that 9 out of 10 mobile phone users favor to use the internet on the devices. Owing to the improvement in the technology, there is a fall in the price of smartphone and that day is not far, when everyone in the world owns the mobile phones. All these facts clearly reveal that a mobile web application can optimize the visibility of the business. The mobile web application development is different from website development. The web applications are compatible with all the mobile platforms. They basically run on the browsers. Earlier they could not access all the native features of the smartphones. 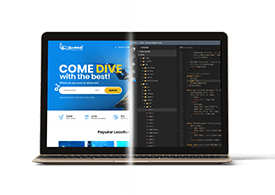 but now, various development platforms have been launched that empower the developers to code the web applications with native look. jQuery Mobile is one of the best launched platforms. Supports Ajax based navigation system that helps the programmers integrate compelling transitioning and animation effects in the application. Possesses Touch-Optimized features that enable the developers to code interactive UI for pleasing user experience. Packed with event-based functions that enhance the functionality of the application. Integrated with jQuery UI, which makes the application responsive and interactive. With all these amazing features, jQuery Mobile seems to be the best mobile web application development framework. jQuery Mobile makes the web application development easier. To cater today’s demand of mobile application, jQuery Mobile platform is the suitable one. Hope that you are now aware of the importance of this platform for mobile web application development. You can also share the important information regarding this blog by using the comment section given below.